Always running out of time... where did time go? Our culture has something negative and sad to say about time. And no one feels time crunch more often than moms. We never seem to have enough time, even with our super cape on! So, today, I was completely stopped in my tracks when I read Ex 12:1, "This month is to be for you the first month, the first month of your year. 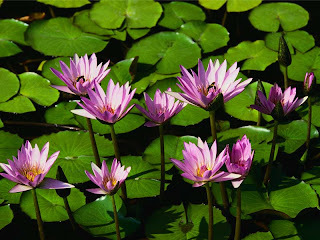 "(NIV) God was leading the Israelites out of Egypt. He was giving them a new calendar along with their new life. And the pastor was explaining it a bit with other wonderful insights. My thoughts, though, parked here and pondered God's time. I guess, He could just give them a new calendar. I never thought about that. What a way to start over! To be given a fresh start with a new timeline, a complete break with the past. And I used to just get haircuts to mark a change in my life. Perhaps the secret to having New Year's Resolutions that stick is to have a new calendar not just a new year! And God does not complain about time. After all, He created it! Maybe the key to rethinking time is to stop feeling negative about it. So what if we are running short on time? There is a time for everything. Some say we need quantity time not just quality time with our children. But why not just capture time by cherishing every moment. I have resolved that a balanced life is just a mirage. I'd rather not chase after this illusion. I would rather enjoy the now of God's timing. Because we have only so much time, some activities will have to go. But what remains can give us the best time of our lives. Celebrate National Doughnut Day! Visit Krispy Kreme on Friday June 5 and receive a FREE Doughnut, one per customer. You can see the press release here. Thanks Abundant Food Savings for this tip! Many coupons are expiring tomorrow, May 31. But for military bases overseas, these coupons are good for 6 more months! If you cringe at the thought of throwing away coupons or are prone to run out to Wal-Mart to buy stuff so you can use up your coupons, this may be the answer to your prayer! Go to this website to adopt a base. What a wonderful way to give back! Then divide your coupons between food and non-food coupons. Put them in separate baggies or envelopes but mail them in one envelope. Label it with the address to the base of your choosing. And your coupons are on their way to a new life! 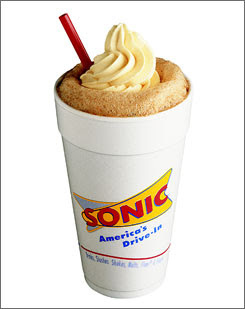 Hurry to Sonic on June 3 from 8pm-closing. Each customer receives a FREE Root Beer Float! No purchase necessary for this deal. Dave Ramsey's online store has great $10 offers, with FREE shipping for orders $65 and over. I learned about this somewhere but I can't remember which blog! 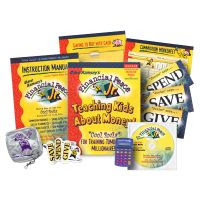 Included are the hardcover edition of Total Money Makeover and Financial Peace Jr. For Kids. I highly recommend reading the Money book. It's an in-your-face guide but chockful of testimonies to encourage your journey. Frankly, this book is what got my husband and I on the same page with our finances. And we don't do the cash envelope system (we only need like 3 envelopes). But we have a whole new perspective on spending and saving. The kids' kit has lots of stuff like a calculator, magnets, coin case besides the manual and CD. It's for ages 3-12. These would be great gifts too as well as the Money book. I have been wanting a laundry sorter forever. My method doesn't quite fall in the three-bin darks-whites-lights sorter. So my hubby is building me our own sorter that would be flush against the wall in our closet. The frame is just from one 2x4. Then I have to sew 5 laundry bags that would be inserted into the frame. So when each bag is full, the whole thing can go into the washer, minus the bag of course. I can't wait to use it! This is by far Tony's most simple and innovative 2x4 concept. He has been busy building other things around the apartment. I'm so blessed that he is resourceful! I'll post pictures later to show off his handiwork. I hope you are all enjoying the posts of all the store deals for our Pensacola area. Like you, I want to save money, time and gas. So by price-matching (PM) at Wal-Mart I am able to do just that. To make the most of this customer perk, it is important to learn a few strategies. Wal-Mart price-matches grocery, drugstore, department store, home improvement and office supply stores, as long as the store is in the same city and their ads are in the store's sales flier. Each register has these fliers but bring yours anyway, if you have them. You can print the page with the item or buy the paper Weds for grocery deals, Sundays for others (department and drugstores). Have a game plan. Make a separate grocery list just for price match items. Write down the store name as well as the sale price. You can also print out a copy of my Wal-Mart Price Match List of the week. Do your checkout when few people are in line. Find a friendly cashier. Maybe one you've formed a rapport with already. I like my Filipina cashiers and others that go to my church because they know me. Warn the cashier you have price-match items before she scans them. Separate price-match items from your other items at checkout. You do not need to do a separate transaction for the non-price match items, just move them aside. Do not rush the cashier. 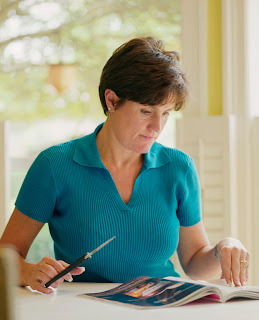 She needs to input each price-match separately and can easily make a mistake. So watch the register carefully. Do not fight with the cashier. If she doesn't want to honor your price-match, and you've politely asked her to reconsider, then just put the item back. You can also take it to customer service later. When you are done, thank the cashier for her patience. Cashiers are generally happy to find out the deals for themselves. So start connecting with the cashier and they'll look forward to seeing how much you'll save next time. You'll be surprised how quickly your savings will add up by price-matching. And by doing the majority of your shopping at one place, you'll less likely want to do extra trips at other stores. Remember to use your coupons too for maximum savings. This post is a compilation of the best deals from other stores that you can price-match at Wal-Mart. I do this often to avoid driving all over the place. You can price match items from any printed ad except Big Lots, as long as there is an actual price per item (NOT BOGO or % off sales). I will write a post later on the best way to chekout if you are price-matching. If there any Wal-Mart rollback items that is just a great sale I will add it here too. Greer's is on Hwy 98 at Bauer Road, before Lillian AL. Call them at 850-455-2719. I've been there once or twice. It's a small and tucked away grocery store. However, I usually price-match their sales at Wal-Mart instead. If you plan to use these prices to price-match at Wal-Mart, remember that they have a copy of the ad at each register too. But I rarely have to show them where it is on the ad. Once you practice price-matching for a few weeks, you'll quickly learn which cashiers are friendly and will not hassle you. Frugal for You is proud to be part of the Grocery Gathering! It is a collection of the best deals in national and local grocery and drugstores. 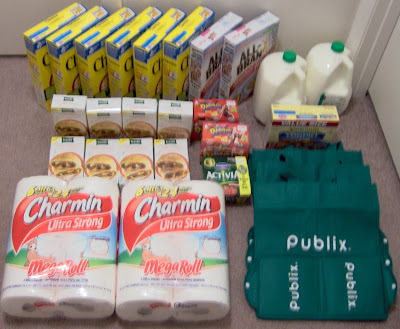 You will also find Frugal For You's Publix, and Winn-Dixie Deals in the Grocery Gathering. You may also view Food World's ads at their website. All these deals can be price-matched at Wal-Mart! Just make sure their price is not cheaper. They know what is on sale at their competitor stores too and often adjust their prices for the week. Frugal for You is proud to be part of the Grocery Gathering! It is a collection of the best deals in national and local grocery and drugstores. You will also find Frugal For You's Publix and Food World Deals in the Grocery Gathering. Thank you Dawn for telling me about BeCentsAble! View the Winn-Dixie ad on their website here. Remember to use you Winn-Dixie card to make these deals work. If I see some great in-store special not advertised in the ad, I will update you! Tuesdays is Rent One Get One Free at our local Friendly Video Rentals (off Blue Angel and Hwy 98). Which is next to Winn-Dixie. I only needed some hotdogs and buns... but I got carried away. Unfortunately, after my kids and hubby were done filling up water jugs ($0.30/gallon at the Glacier machine) and picking up movies and waiting 30 minutes in the car, my husband was not excited that I saved $109. Sorry honey! So I would have spent $153.32. Instead I spent $44.88. That's 71% savings! My coupons were $28.46 and store savings were $86.54. I lost $4.59 in coupons because the manager would not take it. That's ok. I'll use them at Wal-Mart. 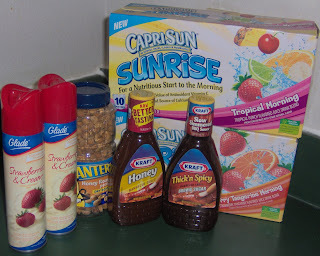 Go to http://coupons.com/ to get many Kraft coupons. Please do not sign-up for anything! Just click on the coupons, install the printer thing, and then click print. Usually the print limit is 2 per computer. (Print more with your other computers) I print mine black and white using the quick print option and have not had any problems with cashiers scanning them. *Scroll down to see what I ended up paying for these items! The chicken will last us for six weeks! The hotdogs are for summer grilling. And the drinks and crackers are for our Hurricane supply. I used coupons from this month's papers and tear-off coupons had at the store. This is the first time I've had problems with this Winn-Dixie. They have a new Center Store Manager who reasoned my coupons were not working because I could not stack it with a store promotion. He said because the Wheat Thins were already BOGO, that's why my $1 off coupon was not working. I never strong arm the manager and this case was no exception. In my experience, you always get back what you lose as long as you stay diligent. Plus I amused the cashier and old gentleman behind me with my $109 savings! On summer break from college, I found my Mom's copies of Tightwad Gazette by Amy Dacyzyzn. It proved to be more than light reading after mounds of homework. I started buying the newspaper and cutting coupons. Many everyday tips from the books were frugal, green and easy enough for me to do even at school. My Dad teased me, saying that when I start my career, I will make enough money and not need coupons. Well, as life often goes opposite our plans, I am now a stay-at-home mom of two, clipping coupons every week. Not that I would have it any other way... most of the time, j/k. Another helpful guide was Ellie Kay's Shop, Save and Share. This book boosted my understanding to new heights. It was a tutorial for shopping smart. Different coupons work differently with store deals. And I learned to tell them apart and save 50%-70% of my grocery bill. 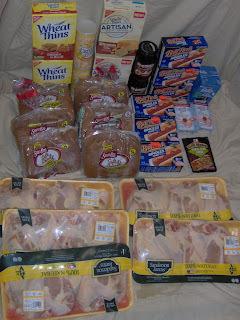 I was still not using coupons that much because Tightwad Gazette gave me lots of recipes for frugal home cooked meals. Most shopping I did was at the perimeter of the store (veggies, meat, and dairy). Fast forward 7 years later. My kids are out of diapers, I'm getting more sleep and my sanity back. I remember MSN asking me why we cancelled our dial-up Internet. Frankly, I told her, my kids keep me on the run that I check email only once a month if at all. That was five years ago! So now that we have Internet again, I've found these Frugal Blogs, and catapulted our savings to 80%-100%. Here are like-minded frugalista stay-at-home moms making the most of their talents for novice and veteran shoppers alike to learn and be inspired. They understood the hard work and payoff of bargain hunting. So as you can see, I would have preferred to have someone hold my hand and take me frugal shopping. But as a bookworm by God's design, I learned from books and at my own pace. And God used other books like Your Money Counts and Total Money Makeover to draw me closer to Him. I didn't know more than 2,000 verses in the Bible talk about money. I had no idea God cared about our financial well-being. But does He ever! I have now learned to turn back to Him what these books have taught. And in return He has given me wisdom, understanding, and peace. I did a quick run at CVS - Innerarity Point, of course, my favorite store. 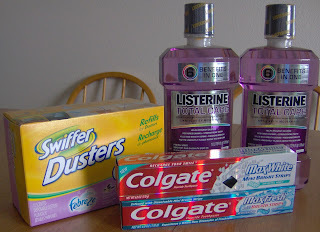 I bought the above products for $1 after ECBs and coupons. They were also out of Speedstick Pro and Clearasil but are supposed get a truck tomorrow. *I ended up paying zero up front after doing some returns. The cashier gave me a money card for $21 and I also used some ECB from last week. So if you have to return something and you paid for it with ECBs, please note they will give you store credit in the form of a CVS gift card. Do you receive WIC Coupons? 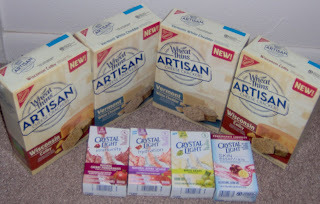 There is still time to double-up on your cereal and cheese allowance for WIC. Buy them at Winn-Dixie by tomorrow. Special K cereal and Kraft block cheese are BOGO. 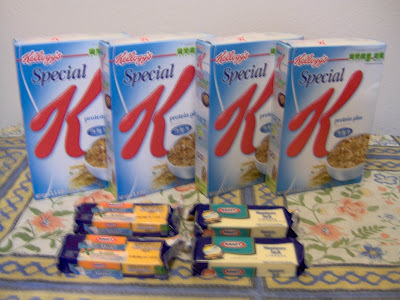 I bought 4 Special K Protein Plus, 2- 2% mild cheddar, and 2 monterey jack. Make sure to use your Winn-Dixie card when checking out, otherwise it will not work. I had the privilege of sharing this tip with a fellow mom getting her WIC items at the cereal aisle. After what I said, she exchanged her Rice Crispies for Special K and Winn-Dixie cheese for Kraft. Anytime you see WIC items BOGO, be it grits, oatmeal, peanut butter or juice, remember to double-up. Cereal is BOGO almost every week at either Winn-Dixie or Publix. And Publix milk is All-Natural without some cow hormone in it. After doing this deal a few times, you'll be surprised how quickly your cereal stash will grow! The great thing is you didn't even pay for it to begin with. Got My Free Pork Plus More! Our total was $27.63. I would have spent $96.60. That's 71% savings! We saved $40.87 in store sales and $28.10 in coupons. Taking out the cost of the beef ribs ($12.84) and charcoal ($6.99), we paid $7.80 for 22 items. That's only $0.35 each! Since this Sunday's paper had no coupons. I didn't buy it. So I went to A Full Cup to view the Target ad. They posted it Saturday. Of course Target's website (on the left hand side) has it too by Sunday. It looks like certain snack foods will get you a $5 gift card. But I didn't see any other deals that would make me rush over there. But FYI, Kellogg's Poptarts has a promo: buy 5 get 1 FREE movie ticket. Only for specially marked boxes. On the back of the box is a movie ticket stub you cut out and collect 5 to send in for a ticket. Each household can send in for 5 FREE movie tickets. All the rules are in the box. And it is good for any movie not just Star Trek! *It doesn't matter where you get the Poptarts from, as long as it says Free Movie Pass. Walmart had the 8 count Poptarts on sale for $1.98 and Publix had them BOGO ($2.45 for 2). Here are deal scenarios for using the $6 off Pork coupon .Buy 3lbs at $2/lb, pay $6, FREE with the coupon! Most of our area stores have pork on sale this week. But if you miss out, please print the coupon anyway. I have seen porkchops go on sale for $0.99/lb at Food World from time to time. And this coupon is good through Dec 31. Go to the next post down for the fine print. The scenarios listed are the best value, or cheapest way to do this deal. At the bottom, the price-match possibilities for Wal-Mart are listed. I'll be buying mine at Publix to try their pork. I also have a $10 off $50 competitor coupon and $5 off $50 Publix coupon. But the best value is price-matching at Walmart, cheapest Total at $7.50. Remember, 3 things to buy for this deal: charcoal, pork and one of these: Ball Park, Hidden Valley Ranch Dressing, Glad Product, KC Masterpiece Product, Vlasic Pickles or Relish. 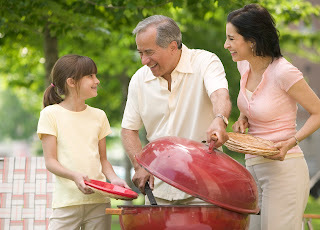 Nothing says summer like BBQ! Kingsford Charcoal has a promotion to help. Print out a $6 coupon off any fresh pork (not processed like ham or hotdog. Visit this site and select the $6 coupon. Save $6 on the Other White Meat when you purchase any 13.5lb or larger Kingsford or Kingsford Match Light Charcoal and one (1) of the following participating brands: Ball Park, Hidden Valley Ranch Dressing, Glad Product, KC Masterpiece Product, Vlasic Pickles or Relish. The coupon does not expire until 12/31/09 and I was able to print multiple coupons and didn't have to sign up for anything. *I first learned about this deal at Money Saving Mom. Most stores (except Wal-Mart) have Kingsford Charcoal advertised on sale for $6.99 and pork on sale starting at $1.39/lb for spareribs. I think I'll be doing this deal at Publix. It turns out their pork is All-Natural (don't really know what that means, but it sounds promising). And they have Gad Cling-Wrap for $1. I'll have a more detailed scenario at a later post. There is always a great deal out there. This can be a problem, especially for busy people. Time spent hunting for bargains gets sacrificed for other priorities. Frustration turns into guilt; guilt into defeat. Then defeat pushes us back to square one -not saving money. I've been struggling with this pattern for a while until I realized something... there is always a great deal out there. If for this week, no gas was spent driving to the store, that's ok. And so what if the whole world got to enjoy 31-cent Scoop Night at Baskin and Robbins? We can wait and go to TCBY on Wednesdays for a 99-cent waffle cone (delicious and a huge serving by the way). I love the verse, "For everyone who has, more will be given, and he will have an abundance." - Matthew 25:25. It's about the story of the master who gave his servants some large amounts of money and how two of the three doubled what they were given. The third one didn't do anything with his portion. Of course the master was none too pleased with this one. While I don't believe this verse is a magic formula or am I preaching some prosperity gospel, I do hold on to this promise. It is my 100% "money back" guarantee that God sees all the hard work we are doing. He knows that we strive to improve our situation. So if we take a break once in a while, it's not a big deal. Give the rest of the world time to catch up with us. No telling what perspective gets straightened out around here with a cup of hot tea and two kids napping! After all God knows all our needs. If we patiently wait on Him, who knows what amazing deals we'll stumble upon. Since my birthday was Tuesday, May 20, most of my shopping was done Monday night. CVS was among my stops. I ended up doing two transactions. Got $4 ECB and saved the $2 ECB from above for next week! Since my birthday was Tuesday, May 20, most of my shopping was done Monday night. Winn-Dixie was among my stops. 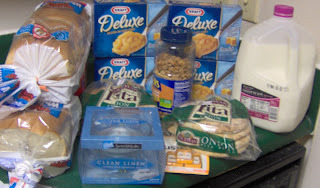 And with the great Kraft coupons from here I was able to snag awesome deals! 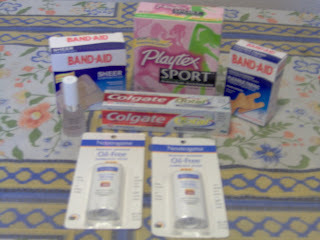 The P&G coupons from May 3rd's Sunday insert came in very handy too. 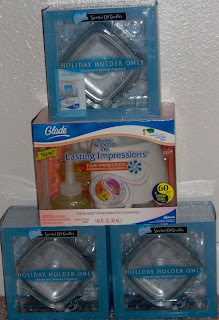 I was able to use these for the P&G Free Dustbuster Rebate. *The Free Dustbuster Rebate Form printed. Since my total was at least $30 before coupons, I qualified for the Rebate. That's why coupons are cool! And I had a $10 off $50 purchase coupon too so I just bought other stuff and used it. $17.56 was actual my total. I would have spent $97.93 but saved $80.37 in coupons, sales, and clearance. That's 82% savings. Please check the weekly ads here to see what products to purchase that you may have coupons for. Scroll down to locate Pensacola Food World stores. They can be pricey so I try to shop only for sales. Meats like split chicken breast and porkchops are usually a great deal there. Remember that Wal-Mart will price match Food World's sale price so you can get these there instead. *When you see an item is BOGO (Buy One Get One Free) make sure you remember to pick-up 2 items. They will charge you the same price whether you get one or two things. *Also, Publix accepts store coupons from other area grocery stores (like Winn-Dixie and Food World). Some Publix stores out-of-town accepts Target coupons. I'm praying our Publix will accept them too someday soon! *For the Orange Beach store, check out the Islander Magazine by customer service. There is a $5 off $50 coupon for that Publix. *Lots of coupon booklets are also near customer service. *Publix Pork is all natural! 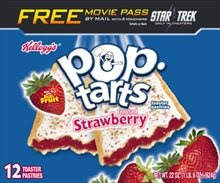 *Buy the Pop Tarts with the Star Trek Free Movie Logo on them. Buy 5 Pop Tarts Get 1 FREE movie ticket by mail. Each household may send in for up to 5 Free tickets! *Publix milk is all natural and doesn't have certain hormones. (It is not organic. They do sell organic also by the gallon). I enjoy shopping at Winn-Dixie for sales and coupon hunts and to use WIC checks. Sometimes I just go through the aisles to look for coupons and get a couple of each. They have blinkies (coupon dispenser), peelies (peel off the actual product package), tearpads, and little recipe booklets with coupons. These are usually manufacturers coupons so you can use them at other stores like Walmart or Publix. I wait until the items on the coupons goes on sale BOGO for extra savings. 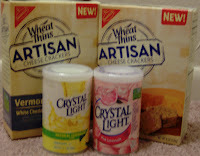 *WIC Alert: Kraft Block Cheese and Special K Cereal are BOGO. Just double the amount of cheese blocks and cereal boxes you normally get and use the WIC coupons as usual. The register automatically adjusts the prices (the free item rings up $0). *There will be no coupon inserts in the Sunday paper because of Memorial Day Weekend. 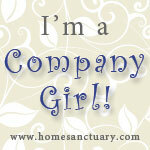 Go here to see what coupons inserts are appearing next Sunday. *Best Choice must be price-matched with Great Value. Both are store brands. $2 Best Choice Pure Vegetable Oil, 48 oz. This week I was able to find a few good deals. 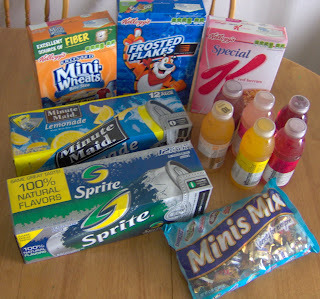 Everything here cost $12.38 for 29 items. That's only $0.43 each! Paid $1.18 or $0.30 each! Paid $2.48 for 5 bottles or $0.50 each! Thanks www.hip2save.com for the posting Walmart deals! Paid $2.08 or $0.52 each! This cheese is at least $3 when not on sale. Barnes is a supermarket off Pace Blvd and another off 9th Ave. They have great deals on meats and produce. I have not been there but I use their weekly sales ad to price-match at Wal-Mart. 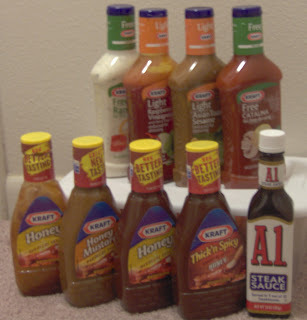 *Flavorite is a store brand name so to price-match, buy Great-Value (Wal-Mart's store brand). $1 Flavorite Shredded Cheese, 8oz. $1.50 Flavorite American cheese singles, 12 oz. 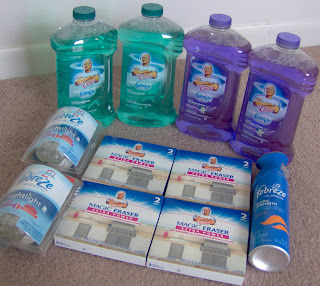 $4 Gain 2x Liquid Detergent, 50 oz. If you have lots of coupons left or just really need a dustbuster like I do this may be worth it. Just make sure you send in the rebate form right away. So for $11 plus tax I can send in for a much needed DustBuster! Thst's already a 66% savings. I also have a $10 off $50 coupon. I'll just need to buy some deals from my earlier post totaling $18 before coupons. *BOGO meats means buy one package and get another free. Just make sure both packages are about the same price. The price in ( ) is the cost of each item after buying 2. $1 Barilla Pasta, including Whole Grains! The Publix ad has a full page of "Essentials". These are food staples at reasonable prices. 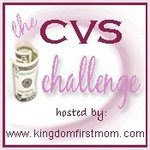 Visit $5 CVS Challenge at Kingdom First Mom! Get $10 ECB for next week! Grand Total $5 out of pocket! View other scenarios at Surviving the Stores, Money Saving Mom, Hip2Save, and The Thrifty Mama. * I may skip CVS this week because I have not found coupons for these deals. Our newspaper carries coupons but we sometimes don't have all the coupons other cities get. And thanks to Hip2Save for coupon match-ups. 1. Up to $2 in value. 2. Amount of doubling cannot exceed current retail price of a single item. 3. No cash or credit will be awarded for any amount exceeding the retail price of thte item. 4. Limit one coupon per item. 5. Only one coupon will be doubled per item. 6. You may only purchase 4 of the same item using double coupons. 7. Coupons do not apply to sales tax. 8. Limit of 75 coupons per customer per day. 9. Sales tax not included in the $35 purchase. They really make us work hard for the money! But I don't mind. My Kmart has not doubled coupons since forever. And this is a start. Plus the $10 Gift Card is a sweet deal too. I have the P&G Year of Savings coupon booklet. It's full of $1 off coupons for Tide, Bounce, Bounty, Charmin, etc. The newspaper usually only has these coupons for $0.25 or $0.35. Great CVS trip morning! This time, I went after Church. And the kids went to the beach with Daddy for a quick fishing trip. (The beach is only a minute away from CVS!) I munched on a (free) granola bar before shopping for extra energy. And it paid off! All-in-all, I paid $9.37 out of pocket, since I used EBT to pay for the food. When buying food with EBT, I still get extra care bucks (ECB). I use the ECB to pay for non-food items. That’s how I got Aveeno for so cheap. Without EBT, my total is $32.86. Cost without any coupons or savings is $119.86. With $4 ECB for later, I really only paid $5.37. That’s 96% savings! I only need $3 for the Swiffer Refill Rebate. When I get $5 back from that, the cost of this trip would only be… $0.37!!! *$1 coupons on the box were expired! So I couldn't use them. That's ok. These sodas would be nice to bring to BBQ's and picnics. 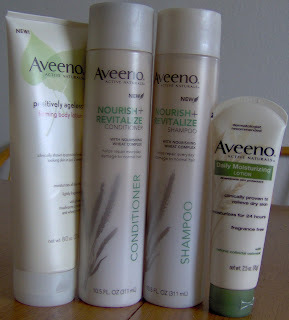 *I found no Aveeno coupons in the newspaper; the small lotion was $3.49 so I only needed one. My out of pocket was cheaper than the small lotion! *Addidas deodorants had $1 on them, I bought 3. 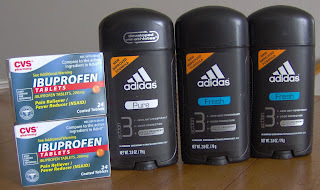 No more $1.25 deodorants. I did get one last week. Also got 2- 24ct CVS Ibuprofen on sale BOGO. And I had $1.50 off CVS brand pain medicine. I had to buy the rest in another transaction. To learn more about the CVS shopping strategies, deals, and just about being frugal, go to Money Saving Mom. I usually stop by CVS on Sunday mornings after Church. I find all I need, nothing is out of stock. And most people are at home or Church so hardly anybody else is shopping. I’ve become acquainted with the employees. They are used to me doing 4 transactions at a time trying to get all my ECBs! For this week, I am planning 4 transactions. I might do separate trips or just buy them on one trip. After Coupons: $1.97 plus tax! Whew! Saving money takes some work. Last night at Publix I would have spent $99.46, if I had no coupons and nothing was on sale. Instead I paid $13.71. That's 90% off my grocery bill! First I used a $5 off $50 Publix coupon. I had $24.50 in manufacturer's coupons and $5.80 in free milk. 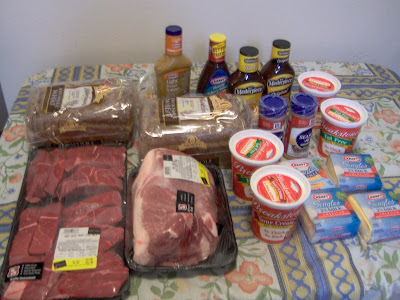 Lastly, I used a $10 Save-a-lot coupon to bring my total to $13.71! Looking for more frugal tips? Check out Life as Mom for the Frugal Friday post.